Target has been slacking for me this year on pumpkin treats. It seemed like they always had at least one new and exciting item and carried more of those hard-to-find big brand items, like pumpkin spice Eggos. However, their slacking has forced me to branch out and scope for pumpkin goodies in other stores, which has proved to be a positive thing. In my recent trip to Aldi, I went on the hunt for pumpkin and did not leave empty handed. 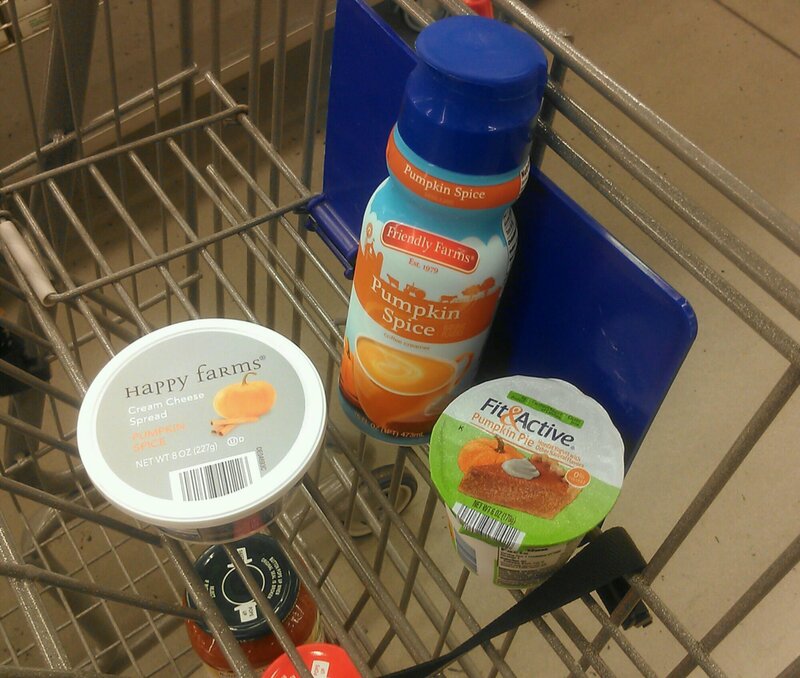 The first thing i tried was the pumpkin pie yogurt. Generally, I try to stay away from milks and yogurts because my stomach likes them better some days than others, but I couldn’t resist. When I first took a bite, it tasted pretty delicious, pumpkin-y and cinnamon-y. Then, the aftertaste was bothersome. I scanned the ingredients and realized it was aspartame. While I could finish it, it became less and less enjoyable with each bite. If the taste of aspartame or artificial sweetener, this yogurt is good for you. The next morning I had a half a bagel with the pumpkin spice cream cheese. The color is an alarming dark and artificial orange coloring with huge flecks of what I assume are nutmeg but can’t be too sure. I slathered it liberally on my bagel half (if I can stick with half a wheat bagel, I’ve earned my extra cream cheese), took a bite, and was not pleased. It was chalky, just like the Great Value version, and tasted as artificial as it looked. I was so upset I refuse to buy pumpkin spice cream cheese unless it’s Philadelphia or Einstein Bros.
We’ll see if I can stick with those convictions. Accompanying my bagel, which was soon replaced by a bowl of cereal, was my signature cup of Veranda Blend Blonde Roast and the pumpkin spice coffee creamer. Now, I’m an avid International Delight pumpkin pie creamer enthusiast (Coffeemate’s pumpkin spice creamer has so much spice it burns my throat if I accidentally overpour), but it seems like this year they have been focusing so much on their new sugar free version that the original version is nowhere to be found. So I decided to branch out and try this. Fortunately, my entire pumpkin haul from Aldi was not a waste because this was delicious. It is almost exactly like the International Delight creamer. I would have just liked it to have had a tad more spice, but otherwise, I was very happy with this and will probably purchase every time I’m at Aldi until it is off the shelf.